This was before legalisation. Cannabis is legal but events are NOT? According to a recent article by the CBC, 420 could be dead. But those in Vancouver will pressure to make sure that the 420 show still goes on. 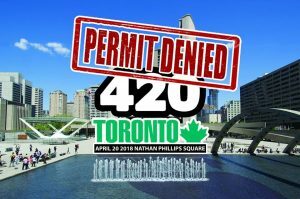 420 events have been around for so long it is hard to imagine not having one in our cities. What do you think about when you hear the words 420? Do you think of violent protests? Thousands of arrests? Fighting in the streets? Of course not. It is probably the most peaceful event you could ever attend. And now that Cannabis is legal the events should still be celebrated. So much more education is needed. The jails are full of people who should not be there. Petty crimes for small possession, not dealing Cannabis. She attends every 420 event as she educates the public on rights. 420 symbolised a time of day that everyone would meet to smoke a joint at school. It was peaceful but still a protest as it was illegal. But not many people got arrested for smoking a joint. Even the famous Dr. Sam Mellace took his protest to the Parliament buildings and lit a joint inside the building. He did it to protest the rights of medical patients to be able to use edibles legally for their conditions. He supported the thousands of people who are not able to smoke or should not smoke (because of Cancer) This video is from 2010 and medical users are still fighting. Sam asked for less political interference, especially from those who have no idea of the medical benefits. 420 events have always been a celebration and protest over the years. It is ONE day that people were left alone to smoke, vape or enjoy edibles. In Windsor there have been two 420 events. The first one was one day and the weather dampened the spirits. The second year it was held over 2 days and was filled with speakers, education and amazing vendors. 420 2019 looks like it may not happen unless people like Sam Mellace stand up and speak up at our local council meetings. How can an event like 420 be stopped but they will allow Beer and Wine Festivals across the country. Why is it being stopped now that Cannabis is legal? Do the people who support these events not have rights? The Government legalised Cannabis in a way that they have FULL control. The Government of Ontario has the only store that sells it. But the licensed producers that supply the store have been in the news daily. Mould, bugs, short changing the weight. Medical users want to be able to smell and touch the product that they use. They want an ample supply which is something the producers are not able to support. Medical users are reporting that they are no longer able to find the strain that was helping their medical conditions and that the prices charged by the Government are ridiculous. How many more years do we have to fight for the rights of medical users? Write to your MP, your MPP and tell them what is happening and that we NEED 420 events to educate and celebrate.